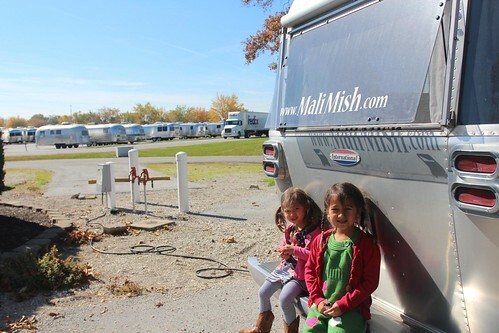 Mali Mish - Day 75: An Airstream homecoming in Jackson Center. Day 75: An Airstream homecoming in Jackson Center. There is something so liberating about waking up in the morning at a boondocking site. Whether you are in the desert, the forest or just a Walmart parking lot, boondocking represents the ultimate freedom of traveling on the road. We woke up at the Walmart in Findlay, Ohio this morning. We decided to head a little further south after dinner last night at the Cracker Barrel in Perrysburg. Even though it is only a 40 mile trip down here to Findlay, it puts us within about a half hour away from Jackson Center, Ohio. That means we are able to take a much more casual pace that we much prefer. 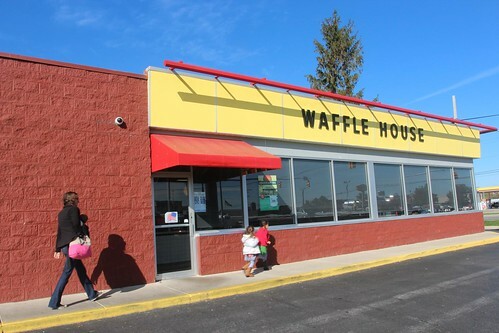 You know you are starting to head south when you start to see Waffle House restaurants. The Walmart in Findlay has one right in its parking lot so we didn’t wait long to pop our Waffle House cherry for this trip. 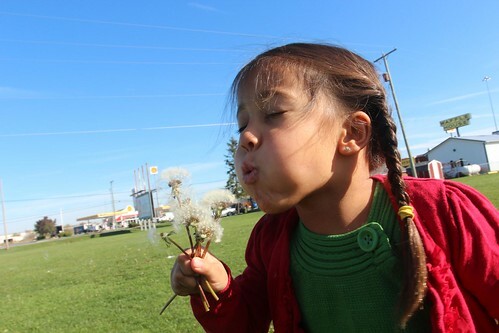 Ava and Mila decided to pick every single dandelion in the field next to us and just looking at this photo makes me want to sneeze. 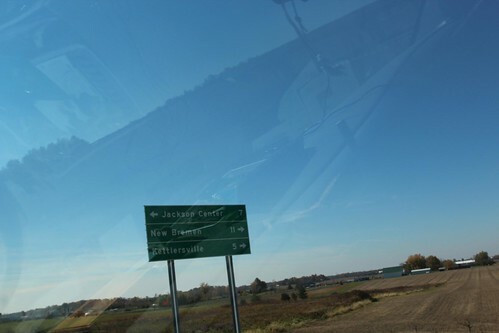 With only 1300 people in the town (technically, it is considered a village), there really aren’t that many people who live in Jackson Center. 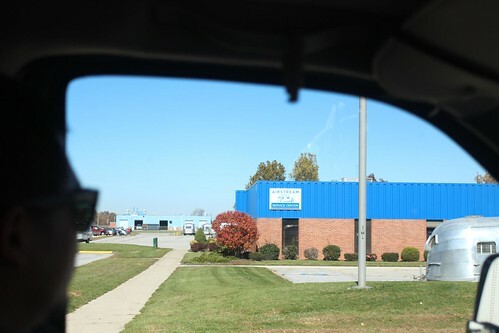 Unlike other towns that we have been through of this size, Jackson Center is not a small town on the outskirts of a big one. There isn’t another town bigger than it within a 15 mile radius. 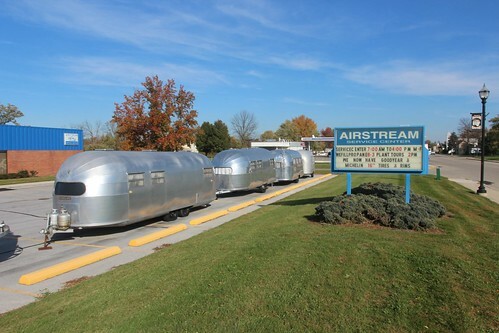 The Airstream factory is pretty much the only reason why this town is still here. As a matter of fact, since the recession, the town has gotten smaller. Just last year, the only grocery store in town closed. 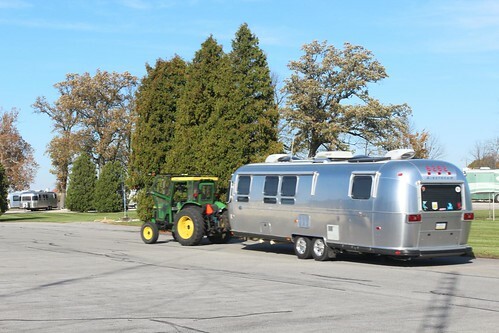 One of the best reasons to come here to Jackson Center is to stay at their onsite campground called the Terraport. Even though you don’t have to own an Airstream to stay here, everyone here does. If you have a service appointment, you get to stay here free of charge. If you are not getting any work done, it is only $10 a night for full hookups which is an amazing deal. 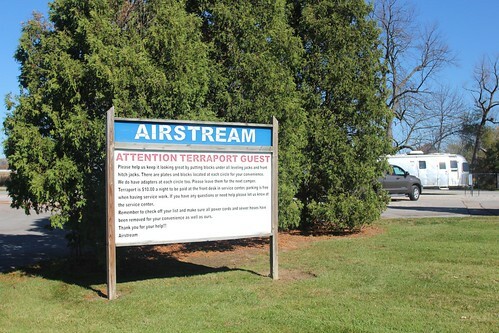 The Terraport is just across from the field where Alumapalooza is held each year. During the inaugural year in 2010, we were just a couple of states south in Tennessee. We were hoping to make it up there then but it did not work out. Alumapalooza is held here during the summer to coincide with an local Jackson Center community event. The weather is usually hot, humid with frequent thunderstorms. Today, the weather here is awesome. 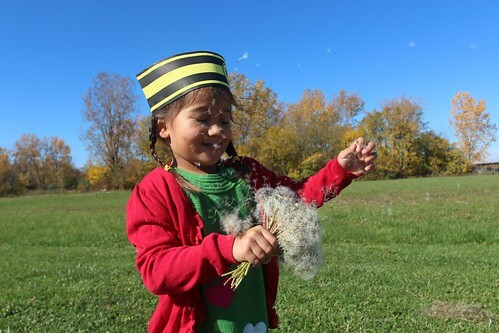 It is a much better time of the year to be here in middle-of-nowhere Ohio. After we got settled into the Terraport, we headed into the service center to check in and to arrange for tomorrow’s service appointment. When you are getting work done and staying at the Terraport, you are welcome to stay in their customer lounge while you wait. 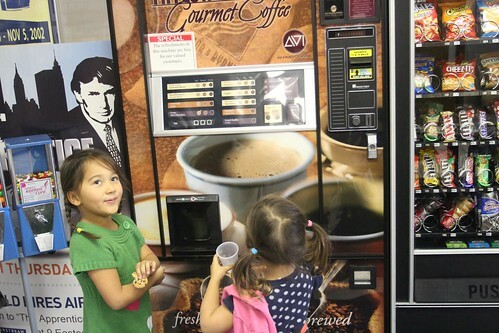 The other deal aside from the Terraport is this coffee and hot cocoa vending machine. It is free for Airstream customers. 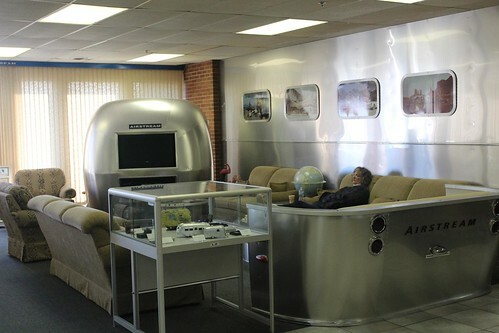 The lounge is very spacious and complete with all things aluminum. An Airstream end cap makes up the TV stand as well as a couch. 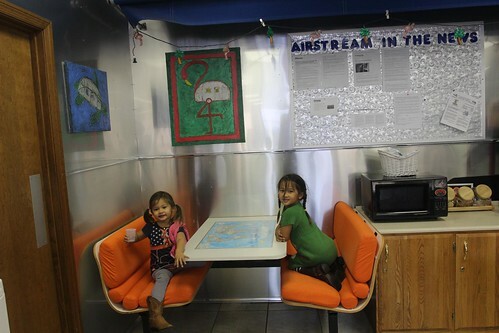 All of the walls are cladded in aluminum and with a dinette mounted next to it, Airstream owners will feel right at home here. 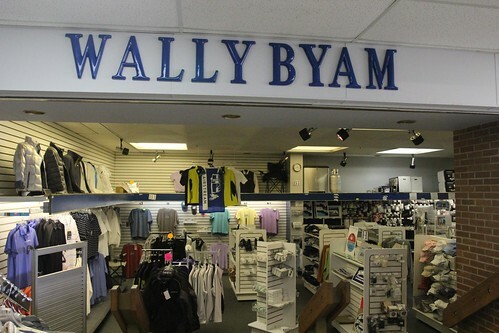 Right next to the lounge you can peruse a gift shop that sells apparel, knick knacks, as well as miscellaneous parts that you might need. If you are hoping for deals like the Terraport and free coffee to continue, you will be sorely disappointed as you enter the store. 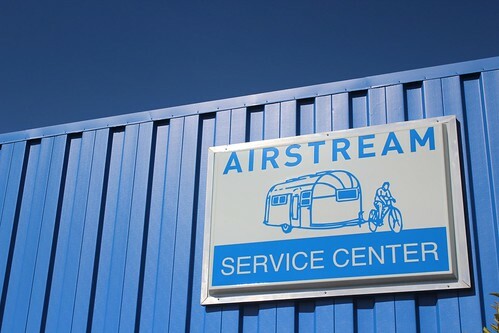 As fans of Airstream, you are probably going to want everything in this store but expect to drop a large fortune here during your visit. When we drove into Terraport earlier, we waved at a passing Airstream who was leaving it. At first we thought it was just another happy Airstreamer happy to be a the mothership. As we got closer, we realized that it was Kyle, Mary and Kathryn of ChannelSurfingwithGas.com whom we met a couple of months ago at Alumafandango. It is always great to see familiar faces at a new place and when we they decided to come back to stay another night next to us at the Terraport, we were thrilled. They had spent a lot of time in New Mexico since Denver and are now on their way back towards Tennessee where they have family nearby and have made their home state as full timers. As dinner time approached we decided to make the drive down towards a small town called Sidney that is about 15 miles away. Did I mention there is nothing in Jackson Center? 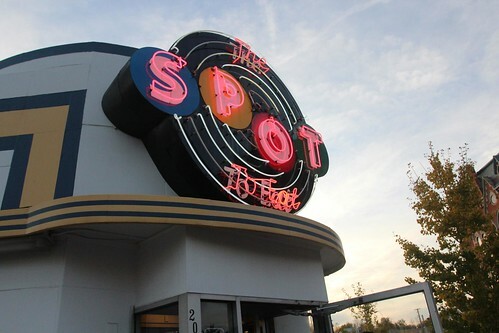 Sidney is home to a popular local joint called The Spot that serves great burgers, malts and pies. 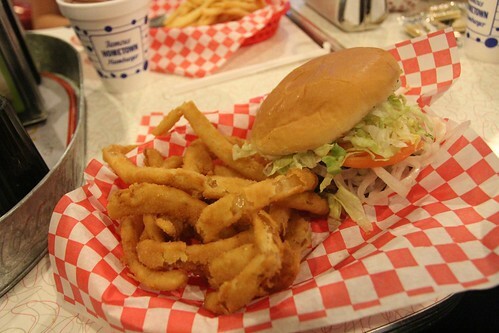 Good burgers, onion rings and Airstrean friends, it doesn’t get much better than this. Tomorrow morning, a tractor is coming to wake us at the crack of dawn for our service appointment. Day 74: A quick peek of Lake Erie and onwards to Ohio. 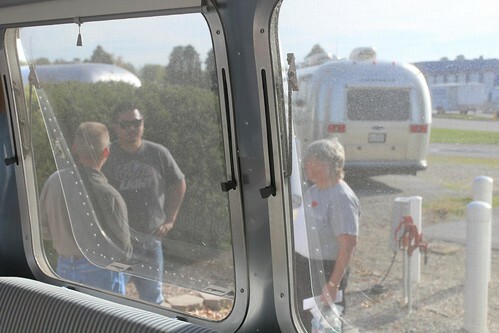 Day 76: Dropping off our Airstream for service.